This article is about the University of California, Berkeley sports program. For the animal, see California golden bear. The California Golden Bears are the athletic teams that represent the University of California, Berkeley. Referred to in athletic competition as California or Cal, the university fields 30 varsity athletic programs and various club teams in the National Collegiate Athletic Association (NCAA)'s Division I primarily as a member of the Pac-12 Conference, and for a limited number of sports as a member of the Mountain Pacific Sports Federation (MPSF). Over the course of the school's history, California has won team national titles in 13 men's and 3 women's sports and 103 team titles overall. Cal athletes have also competed in the Olympics for a host of different countries. Notable facilities used by the Bears include California Memorial Stadium (football) and Haas Pavilion (basketball and other indoor sports). Cal finished the 2010–11 athletic season with 1,219.50 points, earning third place in the Director's Cup standings, the Golden Bears' highest finish ever. Cal did not receive any points for its national championships in rugby and men's crew because those sports are not governed by the NCAA. Cal finished 12th in the 2014-15 standings. In 2014, Cal instituted a strict academic standard for an athlete's admission to the university. By the 2017 academic year 80 percent of incoming student athletes will need to comply with the University of California general student requirement of having a 3.0 or higher high school grade point average. 1 2 This sport is not sanctioned by the NCAA, but Cal considers it a varsity sport. 1 2 3 4 5 6 Team competes in the Mountain Pacific Sports Federation. 1 2 The NCAA classifies swimming and diving as a single sport. 1 2 The NCAA classifies indoor and outdoor track and field as two separate sports. ↑ Team competes in the America East Conference. As of June 5, 2016, the California Golden Bears had 103 team national championships (35 awarded by the NCAA). At the end of 2014, 156 individual national championships, 14 tennis doubles national championships, 40 relay national championships (37 swimming, 3 track), and 47 national championship boats had been accomplished by University of California athletes. The California football team began play in 1885 and with its home games at California Memorial Stadium (since 1923), except for in 2011 while Memorial Stadium was being renovated; the team played at San Francisco's AT&T Park. The team also has produced two of the oddest and most memorable plays in college football: Roy "Wrong Way" Riegels' fumble recovery and run toward the Cal goal line in the 1929 Rose Bowl, and The Play in the 1982 Big Game with the winning kickoff return after five laterals. The program has also produced numerous NFL stars, including Aaron Rodgers, Ryan Longwell, Marshawn Lynch, DeSean Jackson, Desmond Bishop, and Jahvid Best. Tony Gonzalez, the NFL's all-time receptions leader among tight ends, played both football and basketball at Cal. Head coach Sonny Dykes began his tenure in 2012. The California men's basketball team has represented the University of California intercollegiately since 1907 and subsequently began full conference play in 1915. Cal basketball's home court is Haas Pavilion, which was constructed atop of the old Harmon Gymnasium using money donated in the late 1990s in part by the owners of Levi-Strauss. The program has seen success throughout the years culminating in a national championship in 1959 under legendary coach Pete Newell and have reached the final four two other times in 1946 and 1960. The 1926–27 team finished the season with a 17–0 record and was retroactively named the national champion by the Premo-Porretta Power Poll. The current head coach of the California men's basketball program is Cuonzo Martin. Martin scored a significant recruiting coup when star high school players Ivan Rabb and Jaylen Brown signed with the team. Some notable NBA players that spent time playing in Berkeley include Jason Kidd, Kevin Johnson, and Darrall Imhoff. In September 2010, the university announced that baseball would be one of five sports cut as a cost-cutting measure. However, in April 2011, after receiving more than $9 million in pledges from supporters of the program, the program was reinstated. Men's bowling was a varsity-level intercollegiate sport at the University of California in the 1970s and won a national championship in 1979, governed by the ABC (now the U.S. Bowling Congress). The first significant coach in Cal men's crew was Carroll "Ky" Ebright, who guided the Bears for 36 years from 1924 to 1959. During his tenure, Cal crew became known for success on both the collegiate and the international levels. In 1928, Cal fielded one of the most dominant crews of the time as the Bears went undefeated in the United States to win the national championship, earned the right to compete as the United States entry in the Amsterdam Olympics, and won the gold medal. Cal would represent the United States at two other Olympic games and winning the gold each time: the 1932 and 1948 Summer Games. Ebright ultimately led the Bears to nine conference championships and six Intercollegiate Rowing Association championships (i.e., Varsity 8s), with the 1939 squad setting (as of 2006) the best still-standing four mile course record at the IRA. Cal maintained its success during the 1960s under coach Jim Lemmon, who in seven years, led the Bears to three more conference and national championships. In the early 1970s, Cal's lightweight men formed their own club team, California Lightweight Crew, while still rowing out of the same boathouse. The earlier success of the Cal men's crew dimmed somewhat in the 1970s and 1980s, but the Bears did win another national title (1976) and three more conference titles. Steve Gladstone's second stint as coach (his first was from 1973–1980) began in 1997 when he and then-freshman coach Craig Amerkhanian resurrected the men's crew program. The Bears then won seven conference titles, consisting of five straight conference championships from 1998–2002 along with 2005 and 2006. They have also won seven Intercollegiate Rowing Association titles since 1997, four in a row in 1999–2002, again in 2006, also in 2010 under current head coach Mike Teti (who replaced Gladstone in 2008) and most recently in 2016. The University of California's intercollegiate cross country team is under the direction of head coach Tony Sandoval who is in his 30th year at the university and 20th season as the cross country head coach. The University of California's golf team has won one team national championship in 2004 and won two conference championships in 2012 and 2013. They also have one individual national champion, Max Homa, in 2013. The team's home course is at the Orinda Country Club in Orinda, they currently practice at the Metropolitan Golf Links in Oakland, and the head coach (in his 33rd season) is Steve Desimone. Men's gymnastics began intercollegiate competition at the University of California in 1922 and has won 4 national championships and 21 conference championships. The Men's Gymnastics team has also produced 30 individual championships with the most recent being won by Glen Ishino on the pommel horse in 2012. The team's home is the Haas Pavilion and the head coach (in his 3rd season) is Brett McClure. Men's rifle began intercollegiate competition at the University of California in the 19th century and won 5 national championships in the 1950s. At that time, the national event required five firing members per team, one alternate, a team captain and a coach. The national championship competition consisted of ten shots per firing member at 50 feet, indoors. Cal has been the dominant team in college rugby. From 1980, the Golden Bears have won 26 championships, including consecutive championships from 1991 to 2002 (twelve) and 2004 to 2008 (five). Head coach and Cal alumnus Jack Clark has led the team since 1984. Cal Rugby's home is 5,000-seat Witter Rugby Field, located near California Memorial Stadium in Strawberry Canyon. Cal also competes in the Collegiate Rugby Championship (CRC), the highest profile college rugby sevens tournament in the US. The CRC is held every June at PPL Park in Philadelphia and is broadcast live on NBC. Cal reached the finals of the 2010 CRC, losing to Utah in the finals in sudden death extra time, and finished third in the 2012 CRC. Cal won the 2013, 2014, 2015 and 2016 CRC titles. In September 2010, the university announced that rugby would be one of five varsity sports cut as a cost-cutting measure, though the team would have continued to represent the university as a "varsity club sport." A large group of rugby supporters organized to oppose the relegation. On February 11, 2011, the administration reversed its decision on rugby and two other sports, thus continuing them as sponsored varsity sports. Rugby union began play at Cal in 1882 and continued until 1886, when it was discontinued in favor of American Football. Rugby made a return in 1906 after football was deemed too dangerous to play. From 1906 to 1914, Cal rugby garnered a respectable 78–21–10 record. 1914, however, saw the return of football, and Cal would not field a rugby team for almost 20 years. In 1931, rugby returned under alumnus Ed Graff. 1938 began the era of Miles "Doc" Hudson, who guided the Bears for 37 years and an incredible record of 339–84–23. His successor was Ned Anderson, an alumnus and former rugger for the Bears. Men's soccer began intercollegiate competition at the University of California in 1906 and has won no national championships and 4 conference championships. The team currently plays its home games at Edwards Stadium and the head coach (in his 12th season) is Kevin Grimes. Steve Birnbaum was the #2 pick in the first round in the 2014 MLS SuperDraft. Men's swimming and diving has been extremely successful over the years. Intercollegiate competition at the University of California began in 1914 and has won 5 national championships and 2 conference championships. The Men's Swimming and Diving team has also had 49 individual championships and 23 relay national championships. The team's home is currently the Spieker Aquatics Complex near Haas Pavilion and the head coach (in his 5th season) is David Durden. The California men's swimming and diving team won back to back team national championships in 2011 and 2012. The Men's outdoor tennis team began intercollegiate competition at the University of California in 1925, winning national championships in its first and second seasons, although these team titles were unofficial by virtue of sweeping both the collegiate individual and doubles crowns of the U.S. Lawn Tennis Association. Other schools accomplished this feat only 3 times after 1926 and before the inception of the NCAA team championship in 1946. In addition, the California tennis team has won 6 conference championships, 2 individual championships, and 9 doubles national championships. On the indoor courts, the men's tennis team has won 2 national titles in the Intercollegiate Tennis Association championships in 1980 and 1989. The team currently plays at the Hellman Tennis Complex and the head coach (in his 19th season) is Peter Wright. Men's track and field is the oldest athletic program at the university and began intercollegiate competition at the University of California in 1872 and has produced 1 team, and 26 individual, and 3 relay national championships. The team's current home is the historic Edwards Stadium and the director of track and field (in his 30th season) is Tony Sandoval. Men's water polo began intercollegiate competition at the University of California in 1918 and has won 13 national championships and 35 conference championships. The team currently plays its home games at the Spieker Aquatics Complex and the head coach (in his 10th season) is Kirk Everist. Cal volleyball is coached by Rich Feller. In 2010, he was named the American Volleyball Coaches Association (AVCA) National Coach of the Year as Cal finished as NCAA runners-up. Cal completed its most successful season in 2010, as they won the Pac-10 title for the first time in school history and advanced to the 2010 NCAA Championship final, where they fell to Penn State. Senior setter Carli Lloyd was named the 2010 AVCA National Player of the Year and Feller was named the National Coach of the Year. In 2007, Cal reached the final four for the first time in school history before falling to eventual national champion Penn State in the semifinals. Not only did they reach the final four, in their run they were able to defeat defending champion and #2 seed Nebraska, who were the favorites to repeat as champions, in the regional final round, in a sweep (3–0). In 2007, Senior outside hitter Angie Pressey, the daughter of NBA player Paul Pressey, garnered AVCA First Team All-American honors, and was the only Cal player in history to be named to the Pac-10 All-Conference team all four years. Hana Cutura was named the 2007 regional MVP for her helping Cal reach the final four. The first season of women's basketball at Cal was played from 1972–1973, right after Title IX went into effect. The longest tenured coach in Cal history was Gooch Foster, who captained the team from 1979 to 1996 to two conference championships and 11 winning seasons. Up to the 2005–2006 season the Bears have had only three winning seasons. Lindsay Gottlieb is the head coach, hired in 2011 from the University of California, Santa Barbara. The Cal women's basketball began a resurgence in 2006–2007 when it had a 20-game winning season (the last was in 1992) and a second straight trip to the NCAA Women's Tournament, beating Stanford and ending their 50-game Pac-10 winning streak at Maples Pavilion, a No. 25 ranking in the final USA Today–ESPN women's basketball poll, and Boyle and Devannei Hampton receiving Pac-10 Coach and Player of the Year trophies, respectively. In 2007–08, Cal tied the 1983–84 Bears for the most wins in school history (24–4, with one game remaining in the regular season). The Bears have been ranked as high as 8th in the national polls and set a Pac-10 record attendance in women's basketball with 10,525 witnessing Cal's 60–58 loss to Stanford at Haas Pavilion. 2008–09 was the best season for Cal women, as the team led by seniors Ashley Walker and Devanei Hampton completed a successful 15–3 conference record. They had reeled off 11 straight wins to open the season, including a home win over rival Stanford (their first home win against the Cardinal in over 20 years), but fell to the Cardinal in the rematch on the road, and later suffered back to back losses towards the end of the season that took them out of the running for the conference title. Despite a heartbreaking early exit from the Pac-10 tournament at the hands of Southern California, the Bears completed a successful tournament run as the Bears saw their first Sweet 16 in school history. They went up against the undefeated UConn Huskies and even had a nice lead in the opening minutes but ultimately fell to the eventual national champions. In 2009–10 the Bears brought in a top 10 recruiting class to make up for the losses of Walker and Hampton. The young Bears (the starting lineup during conference play featured four freshmen along with star senior Alexis Gray-Lawson) had an up and down year, going 6–5 in non-conference play including a home loss to nearby San Jose State. After an 0–3 conference start that left them two games under .500, the Bears started to find their form, going 12–5 the rest of the way including the Pac-10 tournament. However, the second half success was not enough for an NCAA tournament bid and Cal wound up settling for the WNIT. Although Alexis Gray-Lawson had to sit out the NIT opener because of an injury suffered in the Pac-10 tournament, the Bears edged UC Davis in overtime. Gray-Lawson returned for round 2, and the Bears romped through the remaining games against Utah, Oregon, BYU, Illinois State and finally Miami (FL) in the championship game at home to win the tournament. (It was the first ever championship game held at Haas Pavilion.) Gray-Lawson ended her career as the all-time Cal leader in three points made and games played. In 2012–13, the Cal women reached a record AP and USA Today Coach's Poll #6 ranking at the end of the season, and a 2 seed in the Spokane region of the 2013 NCAA Women's Division I Basketball Tournament. The Bears reached the first Final Four in school history. In 2002, the Cal softball team won its first National Championship against Arizona. Some notable players include Candace Harper, third baseman, and Jocelyn Forest, pitcher, both of whom were team captains. The 2002 Women's College World Series took place in Oklahoma City, Oklahoma. Softball began intercollegiate competition at the University of California in 1972. The team has won one national championship and 6 conference championships. The team currently plays at the 1,204 seat Levine-Fricke Field in Strawberry Canyon, and the head coach (in her 25th season) is Diane Ninemire. Note: Both Cal and the NCAA consider appearances at the AIAW women's final tournament (which was also named and promoted as the "Women's College World Series"), prior to the first NCAA softball WCWS on May 27–30, 1982, to be equivalent to NCAA WCWS appearances. Women's crew began at Cal with a bang, as the Bears won four straight conference titles under Daig O'Connell followed with a national championship in 1980 under Pat Sweeney. However, Cal could not keep up its early success and saw average success for almost the next 20 years. Cal's second renaissance began in the fall of 1998, when coach Dave O'Neill assumed control of the program. Under O'Neill Cal has been invited to the NCAA Rowing Championship every year and has placed among the top three teams at least ten times since 2002. Cal finished third in 2008, 2011 and 2012, and second in 2009, 2010 and this season . Cal won the NCAA team title in 2005, 2006 and 2016. On at least two occasions, Cal won the Varsity 8 race, the premier event at the championship. Since 2004 the Cal women also have won at least seven Pac-10 Championships, including the Varsity 8 race at least six times. Cal's 2010 team will be remembered for the courage and determination of Jill Costello, who coxed the V8 to victory at the Pac-10 Championship while battling lung cancer. Two weeks later Costello and the Cal women narrowly missed winning the NCAA Championship and finished second. Less than a month after NCAA's, Costello lost her battle against lung cancer and died at the age of twenty-two. Costello is remembered each year during Cal's annual dual race against Stanford, the Big Row. Women's field hockey began intercollegiate competition at the University of California in 1976 and has won no national championships (runner-up in the 1980 AIAW championship) and 15 conference championships. The team currently plays at Maxwell Family Field near California Memorial Stadium and the head coach (in her 19th season) is Shellie Onstead, a California Hall of Fame inductee and Cal's first All-American in field hockey. Cal was a member of the Northern Pacific Field Hockey Conference (NorPac) from the league's founding in 1982 until its demise at the end of the 2014 season. The four NorPac members from California (Cal, Pacific, Stanford, and UC Davis) became single-sport members of the America East Conference starting with the 2015 season. The University of California's intercollegiate golf team has produced 1 individual national champion. Also, California women's golf has won two conference championships in 2003, and more recently in 2012. The team's home course is at the Orinda Country Club in Orinda, they currently practice at the Metropolitan Golf Links in Oakland, and the head coach (in her 17th season) is Nancy McDaniel. The University of California's intercollegiate women's gymnastics team began competition in 1974 and is currently under the direction of head coach Justin Howell who is in his second year at the university. The home of Cal women's gymnastics is Haas Pavilion. Women's lacrosse began intercollegiate competition at the University of California in 1999 and has won no national championships and 1 conference championship. The team currently plays at California Memorial Stadium (Witter Rugby Field during the renovation and retrofit) and the head coach (in her 2nd season) is Brooke Eubanks. Women's soccer began intercollegiate competition at the University of California in 1982 and has won no national championships and 1 conference championship. The team currently plays at Edwards Stadium and the head coach (in his 5th season) is Neil McGuire. Genessee Daughetee (Banks) is one of the team's starting defensive players. Genessee is known for her speed and finesse style of play. The women's swimming and diving began intercollegiate competition at the University of California in 1978 and has won 4 national championships and 7 conference championships. The Women's Swimming and Diving team has also produced 35 individual, and 14 relay national championships. The team's current home is the Spieker Aquatics Complex and the head coach (in her 20th season) is Teri McKeever who is also the U.S. Olympic team's coach. The California women's swimming and diving team won back to back team national championships in 2011 and 2012, and has won three of the last four team national championships. Women's tennis began intercollegiate competition at the University of California in 1973 and has won one indoor national championship, one team Conference Championship, and 1 singles conference championship. The Women's Tennis team has also produced 2 individual, and 5 doubles national championships. The team currently plays at Hellman Tennis Complex and the head coach (in her 5th season) is Amanda Augustus. 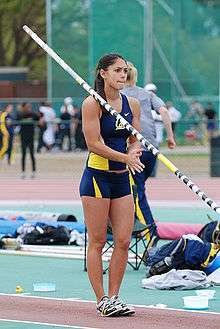 The University of California's intercollegiate women's track and field team has won 3 indoor individual national championships, and 7 outdoor individual national championships. The program is under the direction of Tony Sandoval who is in his 30th year as he director of California track and field. Women's Water Polo began intercollegiate competition at the University of California in 1996 and has won no national championships and 2 conference championships. The team currently plays at the Spieker Aquatics Complex near Haas Pavilion and the head coach (in his 7th season) is Richard Corso. California has won 35 NCAA team national championships. † For this sport, some years may be missing from this list and hence remain uncounted. ‡ Cal also won the individual women's title at the 2002 intercollegiate cyclo-cross championship held in Yountville, California, and hosted by Cal. In addition, Cal men finished in places 2, 7, 9 and 15. It is unclear whether a team champion was declared. If so, Cal would have won the title. The Cal Sailing Team competes in the PCCSC (Pacific Coast College Sailing Conference) which sanctions collegiate racing on the Pacific Coast and is part of the larger ICSA (Intercollegiate Sailing Association). Cal races against schools such as Stanford, USC, University of Hawaii, UC Santa Barbara, and California Maritime Academy. The team is entirely student-run. California Club Tennis Team plays at the club level as part of USTA's Tennis on Campus. The team has had very good recent success, capturing national titles out of 64 total teams in 2010, 2012, 2014 and 2015, with 3rd and 6th-place finishes in 2011 and 2013 respectively. California Ice Hockey Team plays at the ACHA Division II club level as a member of the Pacific 8 Intercollegiate Hockey Conference. The team is coached by Cyril Allen, who took over as head coach in 2001. The Big Freeze is a bi-annual bay area rival between California and Stanford University. It is the fourth most attended event at Cal behind only to its football and men's and women's basketball programs. The University of California department of athletics sponsors a varsity women's volleyball program without a men's equivalent program at the NCAA/varsity level; therefore, California only competes in intercollegiate men's volleyball at the club level. Along with the men's club volleyball program, there is also a women's club team separate from the women's varsity team. According to the UC Berkeley Recreational Sports page, the club men's volleyball program has won a total of six national championships. Occasionally, members of the club volleyball team will help the women's varsity volleyball team with practices and open scrimmages. The California taekwondo team has won 29 national team championships from 1976 through 2016 (includes 3 men's and one women's team titles prior to the adoption of overall scoring). This includes winning the national team championship in every year from 1990 through 2015, except for 2003 and 2013. Known as the "Cal Lightweights" or "Cal Lights," the team is a member of the Western Intercollegiate Rowing Association. In the western United States, Cal Lightweight Crew is one of three lightweight women's rowing teams and remains the sole lightweight men’s rowing team. The alpine skiing team participates in the United States Collegiate Ski and Snowboard Association (USCSA). The eSports at Berkeley competitive video game club won the Heroes of the Dorm Heroes of the Storm (HotS) competition whose grand finals were aired on ESPN2. The team beat Arizona State University in the grand finals and each player won gaming equipment and full four-year college tuition paid for by game publisher Activision Blizzard and national collegiate gaming student network TeSPA. California Memorial Stadium is the home field for California's football program. The venue opened in 1923 and seated between 72,000 and 80,000 fans until the 2010 football season (its final configuration before the renovation seated 71,799), making it northern California's largest football stadium in terms of seating capacity; however, the stadium's capacity dropped to 62,467 seats after the renovation was completed. Memorial Stadium was funded from public contributions, as a memorial to Californians who lost their lives in World War I (1917–18). The chair of the architectural committee was John Galen Howard, the university's chief architect, and his influence is evident in the stadium's neoclassical motif. In addition to its unique architecture, the stadium's position at the foot of the Berkeley hills provides top-row spectators on the east side with panoramic views of San Francisco Bay and west-side viewers with views of the Berkeley Hills and Strawberry Canyon. This has earned it a reputation as one of the most scenic venues in college football. The Simpson Center (known as the Student Athlete High Performance Center or SAHPC during construction) is the new high-performance center for California's student athletes, located right next to California Memorial Stadium on Piedmont Avenue. The new center opened in the fall of 2011 and by January 2012, the final team (football) had moved into the facility. The Simpson Center is home to 13 of California's 32 intercollegiate athletic programs, including football, Men's Rugby, Women's Lacrosse, Men's and Women's Gymnastics, Men's and Women's Golf, Men's and Women's Soccer, Men's and Women's Crew, Women's Field Hockey, and softball. According to the University of California, the facility is a 142,000-square-foot (13,200 m2) complex that will provide "year round access for over 450 student athletes." Walter A. Haas, Jr. Pavilion is the home of California's men's and women's basketball, women's volleyball, and men's and women's gymnastics teams. The arena is located in the middle of the main University of California sports complex, overlooking Evans Diamond (baseball) and Edwards Stadium (track/soccer). The arena was originally constructed in 1933 as the Men's Gym. It was renamed, in 1959, Harmon Gym after Oakland financier A.K.P. Harmon, who in 1879 donated the funds to build Cal's first indoor athletic facility. The playing surface, after being known as simply "Room 100" when the arena opened, was renamed Pete Newell Court in 1987 in honor of Pete Newell, who led Cal to the national championship in 1959. Proposals for replacing the old gym were bandied about from the 1970s onward, but sentiment was strongly in favor of its reconstruction. As a result, the arena was heavily renovated from 1997 to 1999 after a donation of about $11 million from Walter A. Haas, Jr. of Levi Strauss & Co., constructing a new seating bowl within the existing walls. The Recreational Sports Facility is a 100,000 square foot athletics center that is attached to Haas Pavilion and is located on Bancroft Avenue. The RSF features many different rooms for many different activities including, but not limited to: basketball, weight lifting, racquetball, handball, squash, volleyball, and badminton. Attached to the facility is the RSF Field House which is home to many of California's club and intramural teams and has, in the past, hosted the Cal women's volleyball team while Haas Pavilion was under construction. Also attached to the RSF is the Spieker Aquatics Complex, which is home to the California men's and women's water polo and men's and women's swimming and diving programs. Evans Diamond is California's baseball stadium, it opened in 1933 and currently has a seating capacity of 2,500. Evans Diamond is located in the UC sports complex in the southwest corner of campus, pressed between Edwards Stadium to the west (right field) and Haas Pavilion to the east. Originally named Edwards Field, it was renamed after Clint Evans, the Cal head coach from 1930–54. The stadium was renovated in 1992 at a cost of $275,000, paid for by the donations of UC alumni. Construction was done by RNT Landscaping, a San Leandro landscaping company. The stadium is considered inadequate to host regional and super regional games for the NCAA tournament because of its lack of lights. Blue and gold have been Cal’s official colors since 1875. The dark blue represents California’s sky and ocean, as well as Yale University, the alma mater of several of the university’s founders, including its first president, Henry Durant. Gold is a reference to the state of California’s nickname, the “Golden State.”  The shade of gold varies from a more metallic gold on the university seal, and a yellow-gold (also known as California Gold) that is in use by the athletic department. Because of the university's use of blue and gold, the state of California's de facto colors were blue and gold from around 1913 to 1951 and became the official state colors in 1951. The bear has been a symbol of the state of California dating back to the 24-day California Republic in 1846; the state flag displays the image of a bear. The bear, therefore, was seen as a fitting mascot for the University of California. One of the first times the bear was used as a symbol of the university was in 1895 when the California track team went east to compete against the national powers of Princeton, Yale, Pennsylvania and Chicago. The track team brought along a blue banner with an outline of a bear in gold; it became a good luck symbol when the "upstart" team from California triumphed at the meet. Charles Mills Gayley was inspired to write the song "The Golden Bear", which is currently the oldest song in the University of California Marching Band's repertoire. Since that time, the athletic teams of the University of California have officially been known as the "California Golden Bears." In the early twentieth century, Ursae, Bruins and just Bears were common. The use of "Grizzlies" waned because of then-conference opponent Montana Grizzlies and the 1924 extinction of the California grizzly, and Bruins ceased to be used to describe Cal athletic teams when the southern branch of the university (now UCLA) adopted the Bruin as their mascot. The university at times had a live bear cub on the field to serve as the mascot of the university; however, that proved to be unpredictable. The 1941 season saw the debut of Oski, Cal's official mascot. The University of California Marching Band, usually shortened to Cal Band, is the marching band for the University of California, Berkeley. While the Cal Band is student-run, it is administered under the auspices of the university and represents Cal at sporting events and social gatherings. The name of the band is "The University of California Band" by the constitution, but is typically called "The University of California Marching Band" or "The Cal Band". When the band marches out of Memorial Stadium's North Tunnel for football pre-games, it is referred to as "The Pacesetter of College Marching Bands, the Pride of California". When in attendance at basketball games or other small sporting events, a smaller subset known as the "Straw Hat Band" represents the UC Marching Band. Thy praises we shall sing. The University of California Rally Committee, usually shortened to Rally Comm, is the official guardian of the University of California's spirit and traditions. The committee is in charge of the protection of the Stanford Axe (while Cal is in possession of it), the Bonfire Rally, the Cal flags, the California Victory Cannon, Homecoming Rally, the upkeep of the Big C, and many other spirit related activities. Rally Comm is completely student-run and can be found at almost every major sporting event and many other events throughout the Bay Area and country. 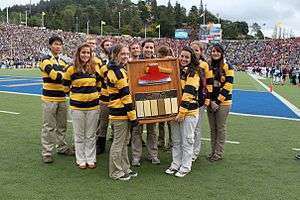 The most distinguishing feature of the University of California Rally Committee are the blue and gold striped rugby shirts that serve as the official uniform of the committee. The University of California Mic Men, (formerly yell leaders) are a group of four or five individuals who lead Cal cheers and make sure Cal pride is present at all Cal events. The mic men can usually be found leading cheers at California home football and men's basketball games and also MCing rallies such as Noon Rallies on Fridays before every home football game, the Homecoming Rally, and the Bonfire Rally. In the past, the head yell leader as an elected position, however, students now have to audition and apply to become a mic man. The University of California Dance Team, (also known as the Cal Dance Team) is a group of young women who perform at Cal athletic events. The dance team is present at football and basketball games from start to finish, performing both on the sidelines and during halftimes. This spirit institution has represented Cal for decades at various sport and alumni events, performing over 55 different pieces of choreography each year. Annual tryouts, usually in April, are required for current, former and potential new team members. The team was joined with the Cal Cheer Team in 2012. The Bench is the student cheering section for the University of California men's basketball team. Located inside Haas Pavilion, The Bench holds up to 900 students who rowdily cheer on their California Golden Bears at home basketball games. Students who sit on The Bench receive an annual Bench T-shirt each year and continue to make Haas Pavilion one of the loudest basketball arenas in the Pac-12 Conference. The Bench prides itself on standing the entire game and ensuring that the arena is a hostile place for any opposing team to play. Although exact dates are not known, the tradition of The Bench was drastically changed in October 2000 when renovations on Haas Pavilion were completed and put a row of portable chairs between the student section and the court. University officials called the move necessary for the protection of referees and players, but students were angry at the move because it further removed them from the action. The Victoria Prank – On March 4, 2006, The Bench undertook one of the most elaborate and successful basketball pranks in all of NCAA history. Weeks before the game between the University of Southern California and the University of California, Berkeley, began, a number of members of The Bench and the UC Rally Committee began instant message conversations with USC's star Gabe Pruitt. The Cal students posed as a UCLA coed named "Victoria" and convinced Pruitt to send pictures, phone numbers, and make a date after the game. During the game, The Bench began chanting "VIC-TOR-IA, VIC-TOR-IA" and completely destroyed Gabe Pruitt's game. He ended up shooting a dismal 3 for 13 from the field. The Bench has become infamous for its "(Un)official Guide to Heckling," which is a student produced profile of the opposing team. The Guide highlights interests, facts, or other things that can easily be used to heckle the opposing team. California shares a traditional sports and academic rivalry with nearby Stanford University. Both schools operate in the San Francisco Bay Area with the University of California in the East Bay and Stanford in Santa Clara County. While the schools have a rich athletic rivalry with the football programs meeting 114 times, they also share an academic rivalry: the University of California, Berkeley, is commonly considered the best public university nationally while Stanford University is thought of as being one of the best private universities in the country. Athletic events between the two schools are usually signified by being the "Big whatever", examples include: the Big Game (football), Big Tip Off (basketball), Big Spike (Volleyball), Big Splash (Water Polo), Big Meet (Track & Field), Big Freeze (Club Ice Hockey), et cetera. Women's basketball does not follow the normal naming template for games between the two schools and is simply known as "The Battle of the Bay." The annual football game features both teams vying for the Stanford Axe. The University of California Rally Committee in possession of the Stanford Axe. The Stanford Axe is a trophy awarded to the winner of the annual Big Game, a college football match-up between the University of California Golden Bears and the Stanford University Cardinal. The trophy consists of an axe-head mounted on a large wooden plaque, along with the scores of past Big Games. Stanford is currently in possession of the Axe after beating Cal 31–28 on November 19, 2011 at Stanford Stadium in Palo Alto, California. California was last in possession of the Axe from November 22, 2008 to November 20, 2010 after winning the 2008 and 2009 Big Games in Berkeley and Palo Alto respectively. *In 1950 and 1953, the Big Game ended in a tie. Because California was already in possession of the Axe, it remained in Berkeley. The World Cup is awarded to the winner of the annual rugby union series between the University of California Golden Bears and the University of British Columbia Thunderbirds. In rugby, California's traditional rival is British Columbia, not Stanford, which led to the creation of the World Cup. California was the 2013 World Cup winner, defeating UBC 28–18 in Berkeley on February 16, 2013 and 38–6 in Vancouver on March 24, 2013. 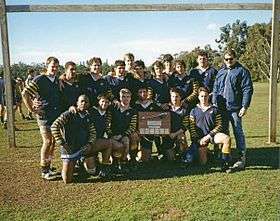 Although California's main rival in rugby is British Columbia, the rivalry between California and Stanford in rugby has been going on for more than a century. The trophy awarded to the winner of the California-Stanford rugby match is known as the "Scrum Axe", which is a play on the "Stanford Axe", the trophy awarded to whichever school wins the annual rugby contest. California retained its hold on the Scrum Axe on January 26, 2013, in Berkeley, winning their 17th straight meeting over the Cardinal 176–0. Throughout the years, the University of California has been well represented in the Summer Olympic games with Cal athletes winning 90 gold medals, 40 silver medals, and 28 bronze medals. Despite the fact that the university sponsors no sports that compete in the Winter Olympics, California does have 1 gold medalist from the 1928 Winter Games. At the 2016 Summer Olympics, California's at the time enrolled students won at total of 18 medals, including 9 gold ones. Sixteen of those medals were won in swimming. ↑ "Visual Identity". California Golden Bears. 2013-04-17. Retrieved 2016-07-12. ↑ Staff, Isaac Smith |. "Academic Senate releases new admissions criteria for student-athletes". The Daily Californian. Archived from the original on 2015-12-29. Retrieved 2015-12-29. ↑ "California Golden Bears - University of California Official Athletic Site". Calbears.com. Retrieved 2016-03-20. 1 2 "History of College Bowling". Retrieved December 1, 2013. 1 2 "Intercollegiate Rifle Team Trophy" (PDF). Retrieved December 1, 2013. ↑ "UNIVERSITY CADETS BREAK THE RECORD. GOOD SHOOTING DONE AT THE RIFLE RANGE. The Berkeley Team Does Great Work in the National Tournament of College Marksmen". The San Francisco Call. April 16, 1899. p. 15. Retrieved March 21, 2013. 1 2 "At California's University. That great institution is striving to lead all others.". Amador Ledger. (Jackson, Calif.). "The University Rifle team, which for a number of years in succession has held the American intercollegiate rifle championship, has again challenged all the military colleges of the country.". March 16, 1900. p. 1. Retrieved March 21, 2013. 1 2 Benjamin Shambaugh, ed. (Apr 1923). "Iowa journal of history and politics". XXI (2). State Historical Society of Iowa: 260–264. Retrieved June 5, 2010. ↑ "California season-by-season results". sports-reference.com. Sports Reference LLC. Retrieved May 25, 2014. ↑ ESPN, ed. (2009). ESPN College Basketball Encyclopedia: The Complete History of the Men's Game. New York, NY: ESPN Books. p. 532. ISBN 978-0-345-51392-2. ↑ "Five-star forward Jaylen Brown commits to Cal for 2015-16". CBS Sports. 1 May 2015. Retrieved 2 July 2015. 1 2 "Cal to Cut Five Intercollegiate Teams". The Daily Californian. September 28, 2010. Retrieved September 28, 2010. ↑ "Cal baseball team to be reinstated". The Daily Californian. April 8, 2011. Retrieved April 15, 2011. ↑ "University Items". Daily Alta California. 40 (13321). February 15, 1886. p. 6. Retrieved March 21, 2014. ↑ "The Eastern Shore. News from Alameda, Berkeley, Oakland and Environs.". Daily Alta California. 42 (14158). June 6, 1888. p. 8. Retrieved March 21, 2014. ↑ "The Eastern Shore. News from Alameda, Berkeley, Oakland and Environs.". Daily Alta California. 80 (61). March 2, 1889. p. 8. Retrieved March 21, 2014. ↑ Affairs, Public (February 11, 2011). "Three UC Berkeley athletic teams to be preserved". Newscenter.berkeley.edu. Retrieved August 23, 2014. ↑ Archived May 22, 2013, at the Wayback Machine. ↑ Archived December 17, 2012, at the Wayback Machine. ↑ "Bears Crew Wins Douglas Cup Event". Los Angeles Times. Los Angeles, California. 27 Oct 1975. p. 49. ↑ "2002 US Cyclo-cross Nationals (Men) - CN Domaine Chandon, Yountville, California, USA, December 14-15, 2002". Retrieved 2016-05-14. ↑ "2002 US Cyclo-cross Nationals (Women) - CN Domaine Chandon, Yountville, California, USA, December 14-15, 2002". Retrieved 2016-05-14. ↑ "American Collegiate Hockey Association powered by GOALLINE.ca". Achahockey.org. Retrieved August 23, 2014. ↑ "Retour vers le futur". Saveberkeleyiceland.org. April 20, 2011. Retrieved August 23, 2014. ↑ "Cal Rec Sports | University of California, Berkeley". Calbears.berkeley.edu. Retrieved August 23, 2014. ↑ "UC Berkeley Men's & Women's Volleyball". Calclubvball.com. Retrieved August 23, 2014. ↑ "History of National Collegiate Taekwondo Association Championships and FISU Games". Retrieved December 1, 2013. ↑ Marks, Tom (April 27, 2015). "Heroes of the Dorm finals were a success story for esports". PCGamer. Retrieved May 4, 2015. ↑ Molina, Brett (March 6, 2015). "Blizzard unveils 'Heroes of the Storm' tournament". USAToday. Retrieved January 20, 2016. ↑ "Memorial Stadium". University of California, Berkeley. Retrieved March 17, 2007. ↑ "Traditions of Berkeley". UC Berkeley. ↑ Djukic, Nina (December 8, 2014). "Trivia Quiz: How well do you know Berkeley". Daily Californian. ↑ "California State Library – History and Culture – California State Symbols". Library.ca.gov. Retrieved August 23, 2014. ↑ "Cal Songs ~ University of California Marching Band". Calband.berkeley.edu. February 18, 1969. Retrieved August 23, 2014. 1 2 Chan, Steffi (February 2, 2007). "Arena Evaluation: Cal – SIOC's got the scoop on Haas Pavilion". Sports Illustrated. Archived from the original on October 20, 2012. ↑ "California Golden Bears – Traditions". CBS Interactive. Archived from the original on February 7, 2012. ↑ Duffy, Matt (October 11, 2000). "Midnight Madness Gone After a Year". The Daily Californian. Archived from the original on September 30, 2007. ↑ Gyr, Alex and Daniel Novinson (March 8, 2006). "'Victoria' punks Pruitt". The Stanford Daily. The Stanford Daily Publishing Corporation. Archived from the original on June 25, 2008. ↑ Wagner, Greg (March 8, 2006). "Cal's AIM stunt that duped Pruitt shouldn't surprise any of us". Daily Trojan. University of Southern California. Archived from the original on January 2, 2008. ↑ "Cal overpowers UBC men's rugby to win World Cup trophy". Ubyssey.ca. March 24, 2013. Retrieved August 23, 2014. ↑ "East Bay local sports: Cal Bears retain Scrum Axe with rugby rout of Stanford – San Jose Mercury News". Mercurynews.com. January 26, 2013. Retrieved August 23, 2014. ↑ "Rio Olympics 2016: Which schools won the most medals?". 2016-08-22. Archived from the original on 2016-09-03. Retrieved 2016-09-03. Wikimedia Commons has media related to University of California, Berkeley athletics.